Back before the hustle and bustle of the holidays, I had the opportunity to ride out just west of Charlottesville and visit with Cass Cannon, the owner of Peg's Salt. Since making the connection with her, I've been excited to talk about the blended salts here on the blog and share some of the history behind it. Similar to my own story, Cass spoke about her own dream of leaving the corporate world to pursue a passion with food and to keep the salt legacy of her mom, Peg, alive. Cass was lucky to have gotten her mom's recipe and has been making her dream of running the business a reality since October of 2012. Over 40 years ago, her mom created and handed out to family and friends an all purpose blend of kosher salt and spices that continued once all of the children had left the nest. 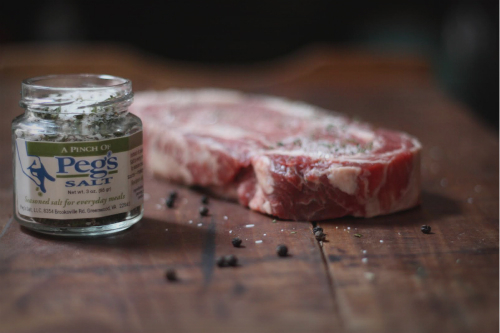 This salt is the perfect accompaniment to the stovetop and as marketed, a pinch is all that's needed to flavor most any dish. Cass also has an eye and passion for the history of salt — I loved getting a chance to look through her collection of many vintage salt boxes, bins, and jars. I was amazed at just the small collection she pulled out to show me during my short visit as she said this was just the tip of the iceberg. Working from home, Cass blends, packages and ships her salt to large retailers such as Whole Foods Market in Charlottesville, Relay Foods and to specialty smaller scale grocers such as Little House Green Grocery and Libbie Market here in Richmond. 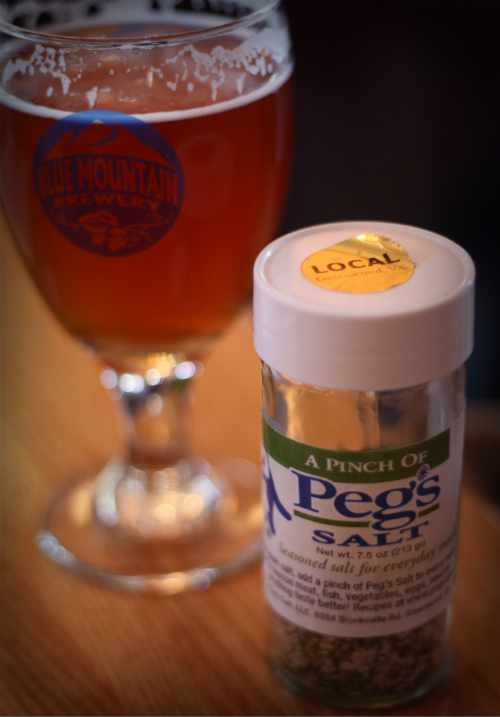 Upon wrapping up my visit, lunch had to take place at Blue Mountain Brewery, located 2 miles down the road where, you guessed it — there was Peg's Salt on the table, which was a perfect addition to my fries! 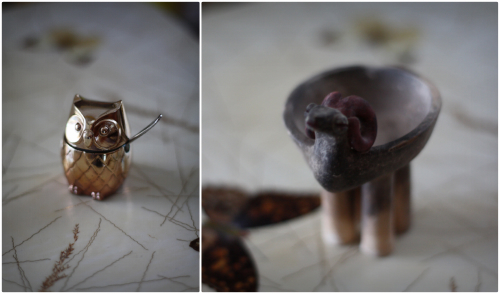 Peg's salt is a now new addition to my counter, right up beside my trusted pepper grinder! Learn more and keep up with what's going on at Peg's Salt over on their Facebook page or on Twitter. E.A.T. local E.A.T. well with a pinch of Peg's Salt!